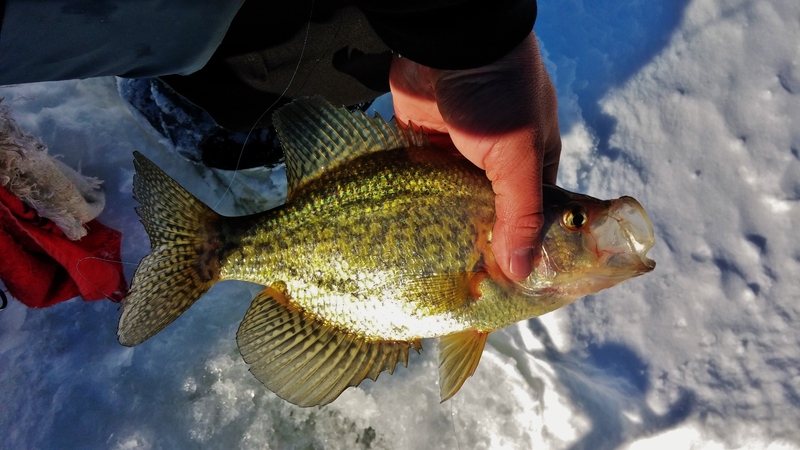 Another day of chasing panfish was on the ticket for today. Knowing what the walking conditions would be with the recent snow and warm up, the locations were chosen by their distance from the parking lot. With a few spots in mind, a buddy and I hit the road before sunrise. We figured that we would go to the furthest spot first and work back towards home. Arriving at our first location, we had several spots on my GPS that have produced in the past. We started off in deep water but found mainly small crappie and bluegill. While they were aggressive, there were very few quality bites. With a bad bite in deep water, we figured that we should slide shallow and search out the weeds. Luckily this move played out in our favor. The fish were there and the numbers seemed to be on a 5-6 foot break outside the weeds. 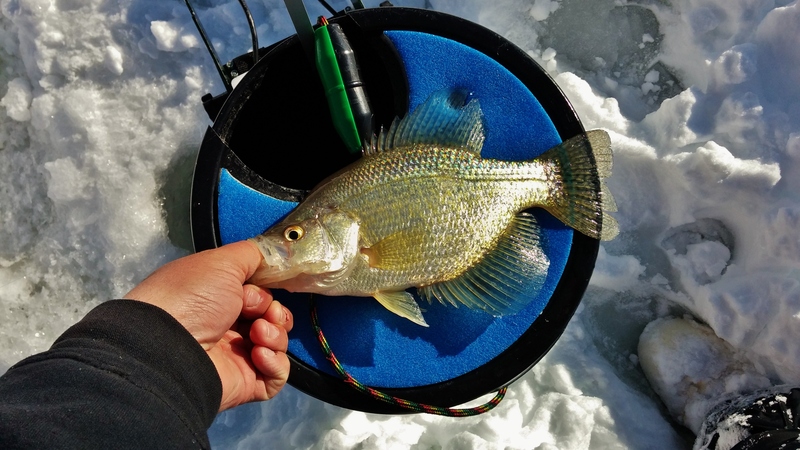 Mainly, we caught pumpkinseed and bluegill but by fishing right under the ice, we caught far more crappie. While the bite was steady, it wasn’t great so we packed up and moved. Our second and final stop of the day didn’t prove much better but the quality was right. On a normal day, the fish are very spot specific at this location but sometimes it takes a bit to locate them. Even with the deep snow and slush we covered some water. We took turns packing and clearing spots for holes while the other one drilled. After about 30 minutes of cutting we were ready to fish. We started at opposite ends of the fishable area and soon were into fish across the spread. 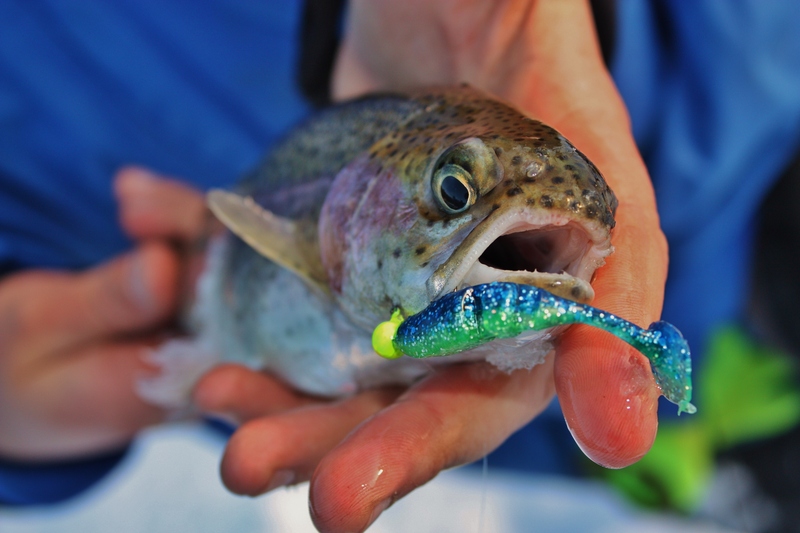 While the fish were quality, it seemed as if the holes would produce one fish then quit. Working through the holes over and over was unproductive for the most part so about an hour before dark, we packed up the car and headed for home. While most people were out romancing their significant others on Valentine’s Day, I was at work. 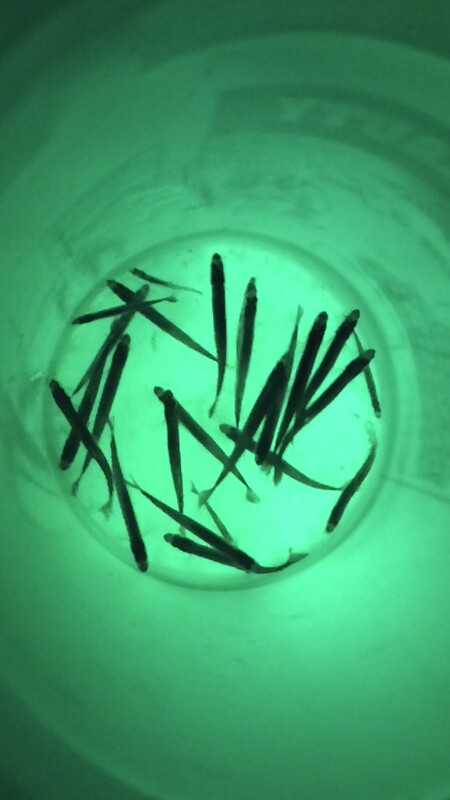 For a bit of redemption, my girlfriend Mary agreed to a Hydro Glow lit dinner on the ice chasing smelt. I got out of work a bit early so that we could be on the water before sunset. It was around 5 when we were set up in the shack with the Mr. 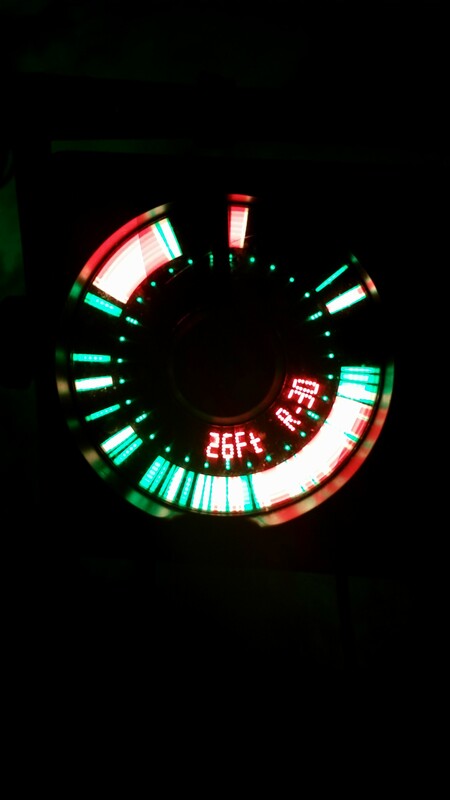 Buddy heaters blazing. 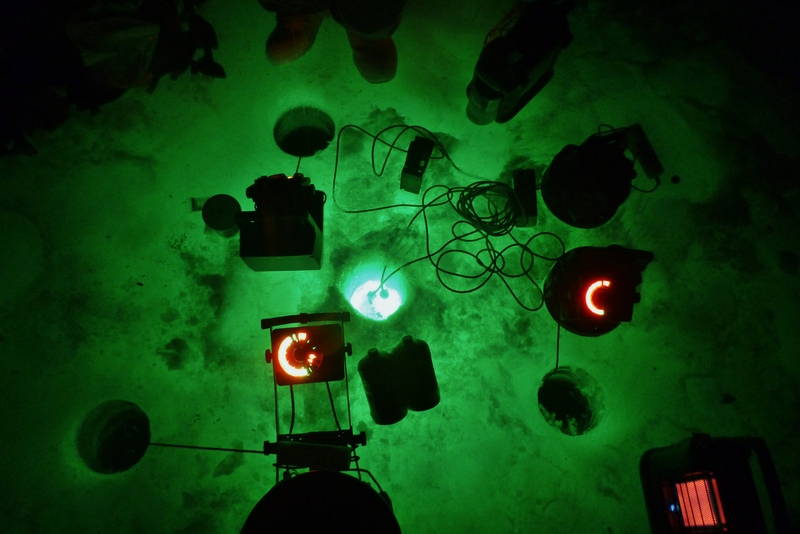 It took three holes for us to find the mid 20’s depth that I was looking for and about 5 minutes with a submerged Hydro Glow to draw in 24 feet of fish. The first obstacle of the night was for Mary to learn the frustrations of hooking and then actually landing these tricky little buggers. After I caught the first few, I agreed to let her try my spring bobber rod so that the bites were easier to detect. She quickly figured out how it was done and started to out fish me. I upgraded the single size 22 jig so that it would have a small spoon below for added weight. Before too long we were both bring in fish at a good pace. 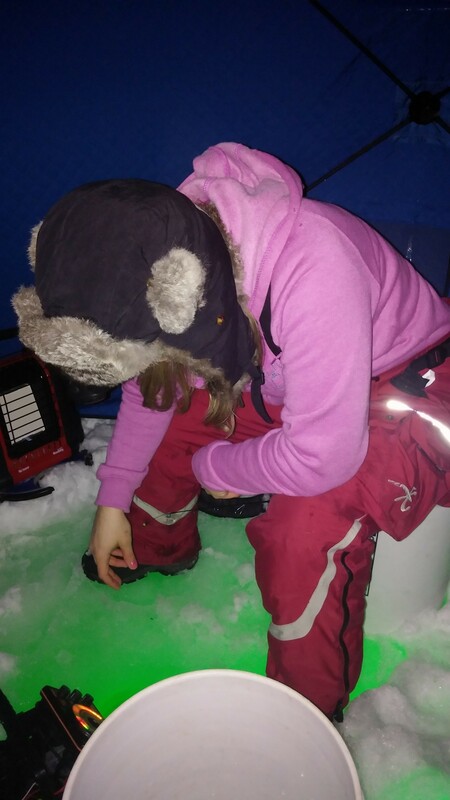 The night ended when the wind started to pick up as we didn’t use the ice screws to secure the Clam hub shack down. While the night might not have been a typical date for most, Mary is excited to get back out! I hit the water around 7 am with a plan on hooking up with a buddy around 1 for a deep water afternoon bluegill bite. Having not been out on this body of water in quite a while, I cut a ton of holes over varying habit types and depths hoping to key in on what they were holding on. 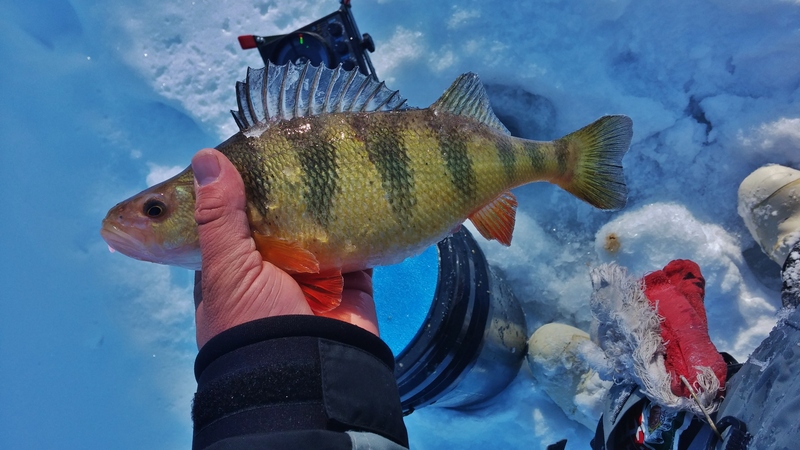 Right off, I found crappie and perch. They were running on a weed edge. The holes that had little to no weeds were the best. While the perch and crappie were fun, I couldn’t resist hitting the weeds to see if the bluegill were still biting. They were and the bigger fish seemed to be hiding out in the thickest weeds. These two patterns that I put together continued until I was forced to leave for my rendezvous point. After meeting up with my buddy, we drove to the bluegill lake and made the short walk out. Having made this trip before we knew that the gills would be deep but we needed to find a better pattern for staying on them. On a prior trip (Bass And Bows… On Accident) we located a hump in deep water. Knowing that this would somehow be key to our success, this was the area we targeted. Our first set of holes was on and around the hump covering quite a large area. As we worked through the spread, the numbers of fish that we were seeing was good. While there were a lot of gills, many were small. Not losing faith, we kept fishing. In the mix were quite a few bass and rainbows. 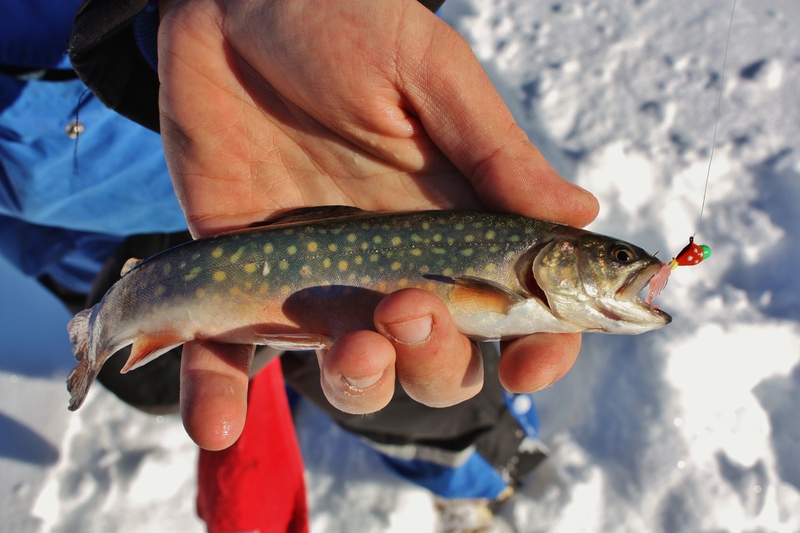 As the holes got shallower, all species were void excepts for a new one for us on this body of water; brook trout. 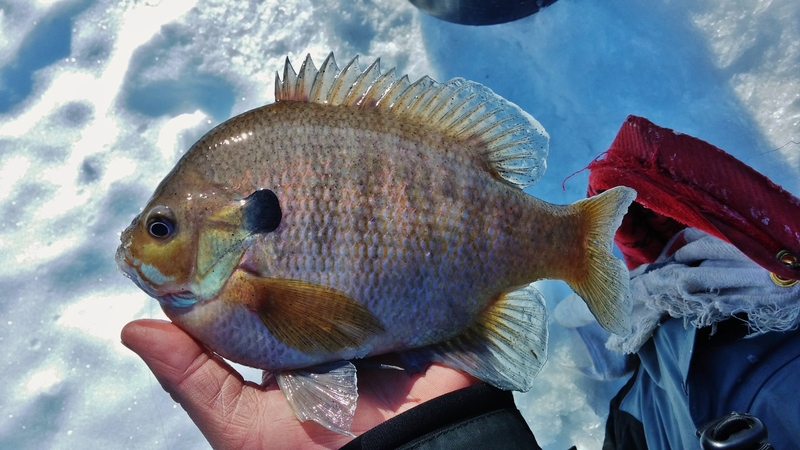 The trip wasn’t a total bust but we never really located the numbers of bluegills that we had hoped for. What better way to expand your time on the water than to get out at night. 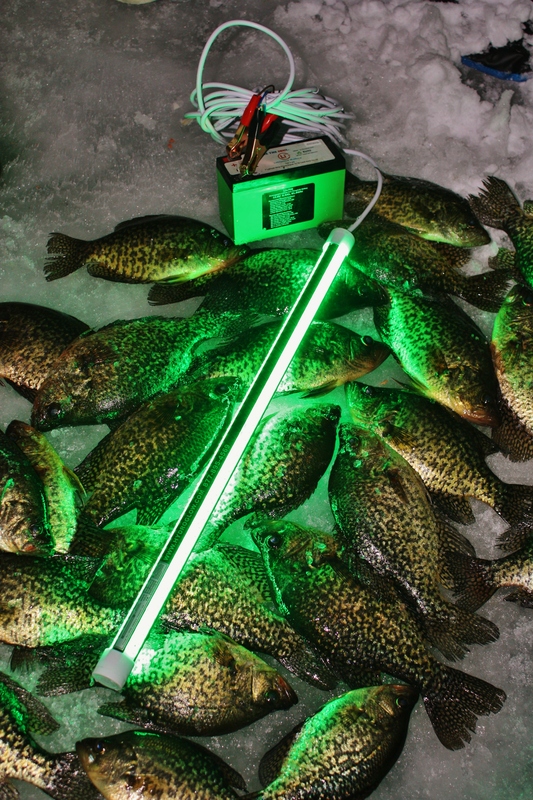 With a few Hydro Glow Fishing Lights packed in the car, we got on the ice just before sunset. We punched 4 holes inside of the hub style Clam shanty so that three of us could fish with one left in the center for the light. 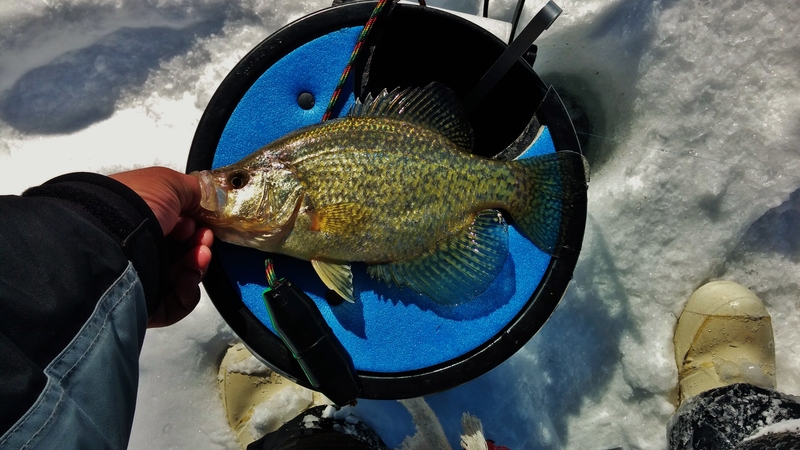 To target these crappie, we set up in 8 feet of water that was about half stacked with dense weeds. We mainly worked above the weeds but from time to time dropped down in about a foot trying to shake things up. 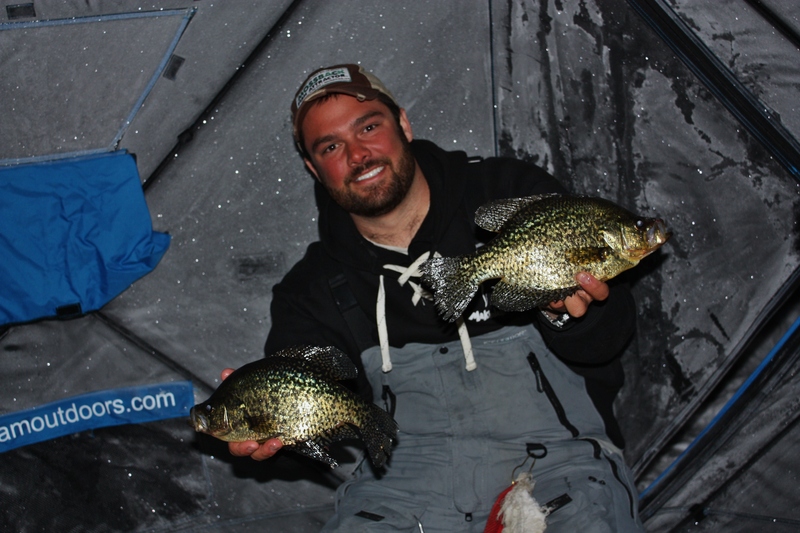 For the most part, the crappie were cruising the weed tops and the bluegill were down below. The fishing went in spurts. Whether the fish were coming in one at a time or they got spooked when you would bring one up, there seemed to be a short gap between hook ups. 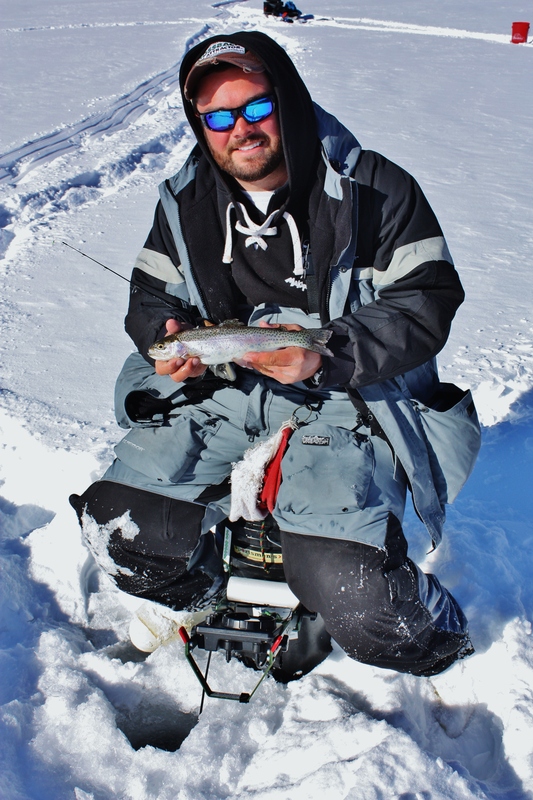 We stayed on the ice until about 1 am with great numbers of quality fish.